Elder Scrolls V Skyrim is the the massive RPG from Bethesda Game Studios, but is it big enough to steal headlines from Modern Warfare 3? There's a moment that occurred in T3's play-through of Elder Scrolls V: Skyrim that rammed home quite succinctly exactly how titanic the game is in size. In every instance where the player enters a new environment, they're greeted with a loading screen displaying a picture of a new creature, or a new weapon, or a new artifact contained somewhere in the game. At the 48-hour mark, T3 was still seeing content we'd yet to encounter. After two solid days of playing Skyrim, the game was still informing us we had so much more to discover. Anyone interested in picking up a copy of Bethesda's new RPG should probably book a week off work. Skyrim demands a tax in the form of time that few other video games can match. Leaving aside the over-arching narrative, which involves a civil war ravaging the land of Skyrim and the return of the dragons against whom the protagonist is pitted, Elder Scrolls V offers players such a huge number of ways to interact with its world that it manages to capture their attention-span to a point, which could be almost considered dangerous. Skyrim is easy to lose yourself in. Players can spend hours, weeks and months exploring its vast expanse, finishing up quests, fashioning armour and weapons, enchanting items, mixing potions, chopping wood and even engaging in the odd spot of reading at the Winterholm mage college library. They can while away frightening amounts of time exploring the game's huge environment, uncovering caverns, dungeons, treasures and cities. They can even, if the mood takes them, buy property, kit their house out with all the necessary features and get married. Skyrim works hard to both immerse the player in its gargantuan environment and make them feel a part of it. It also rewards the player's character for this investment. Everything they do in the game earns XP and proficiency in whatever skills, magic and weapons the player uses the most. When they hit a new level they're offered a top up on their basic capabilities – health, stamina and magic – and a talent point to augment the their skills. Naturally, they're able to better improve the ones they've been using most in the game. Skyrim has been touted as perhaps the most accessible RPG that Bethesda has created to date. What this means to anyone reading this who isn't already interested in the game is that it's available on consoles for the great unwashed. For anyone who has played any of Bethesda's other fantastic games – Elder Scrolls IV: Oblivion and Fallout 3 leap to mind – it means that the control system is as easy to use as it is intuitive. Wll spend a lot of time in the game navigating menus, switching up weapons and magical attacks, looking at the in-game map and levelling up their character. It's a testament to Bethesda's brilliant standard of game design that the vast amount of items the player needs to easily access and the game's combat system compliment each other superbly. The only drawbacks to the game are the bugs and glitches that step in the way the player's progress. We can deal with the odd wonky animation or the rare occurrence where a misstep leaves us trapped in grotto in the game's environment. The odd instance in which a quest in the game doesn't function as its supposed to or a complete crash requiring a reboot is harder to forgive. Skyrim Dawnguard is the first chunk of DLC to be added and brings with it plenty of new features including new weapons, locations and characters. It may have taken a while for the developers to come up with the goods, but it's certainly been worth the wait. The add-on gives you the choice between joining the Dawnguard collective of vampire hunters, or becoming a vamp yourself. If you're on Team Vampire you'll be helping head bloodsucker Lord Harkon to destroy the sun. If you're part of the Dawnguard posse - your task is to stop them. It may not be the most revolutionary DLC in the world, but more Skyrim gameplay can only be a good thing. 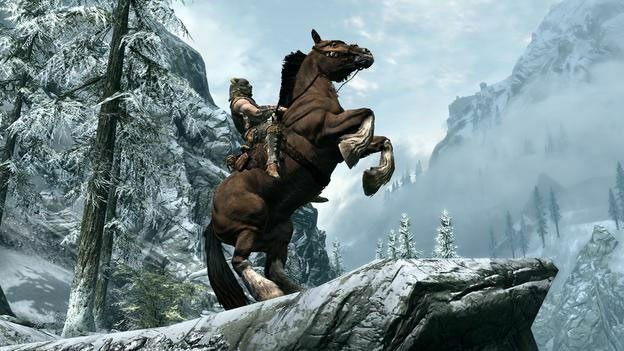 Still, in the light of Skyrim's strengths, its weaknesses pale into near-insignificance. Bethesda are famous in the gaming industry for creating some of the best examples of the Western RPG, and their latest game can only further their reputation. Skyrim is a big beautiful beast of a game and anyone who can blag a week off work should certainly pick up a copy. As if Skyrim didn’t have enough problems, how about an apocalypse?